Thursday evening I had a wonderful opportunity to meet and speak with Todd Mrozinski about his artwork. In addition to the work in his “Shadow Series,” which consisted of 20+ (must be hundreds of paintings), Todd shared the Pop-Up Gallery installation in a former boutique at the Pfister. His work as well as the works of Timothy Westbrook’s are on display and the opening reception is this evening (Friday, June 12). Thank you to Todd and his wife Renee Bebeau as well as Pamela Anderson (from Milwaukee’s Plaid Tuba Gallery) and her husband Steven Kaishian for the wonderful conversation. 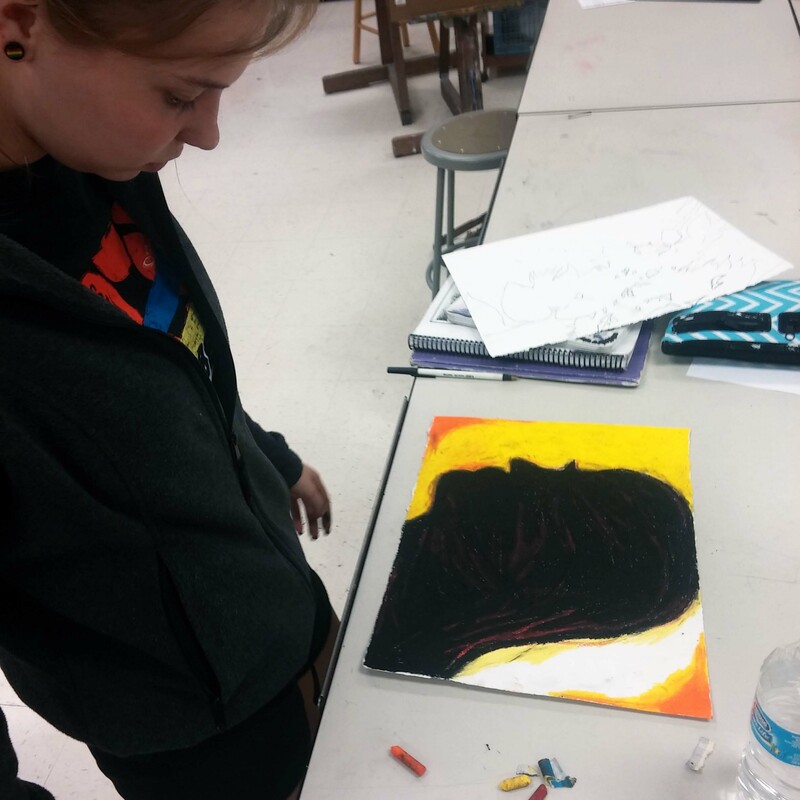 Also below is a great review of student created art inspired by the works of Midwest Artists from Frank Juarez’s (Sheboygan Artist / Educator) book Midwest Artist Studios (MAS). The link to the original site it here, but you can read my excerpt below. Please explore at all the student’s working and works HERE. The Pfister Pop-Up Gallery Press release HERE. I introduced my students to Todd Mrozinski through theMidwestern Artist Studios Project workbook designed by Frank Juarez. In order to help my students better understand who Todd Mrozinski is, I used Frank Juarez’s writing and interview with Todd from the M.A.S. Workbook as well as looking at Todd’s website and video prepared as his application for the Pfister Artist in Residence. From there, we discussed the ideas and history behind diptychs and triptychs. The ideas behind the works were planned around the idea of working with a partner, learning about them as individuals and then working together to create works about one another through the same ideas of Todd – working with the Silhouette of one another and also working with the ideas of shadows cast from plants or trees. Originally, we were going to be creating a triptych and including the shadow of a person made object, one chosen by the partner in the pair, but because of time limitations we only had one artist get that far with the drawing. In the very beginning, we introduced one another through learning the ideas behind the elevator pitch. Using an elevator pitch approach to introduce themselves gave them a good understanding about who they are, what they believe in, how they make art, what their ideas about life and art. From there we all went outside and looked at shadows and the partners worked together to choose which types of plant shadows to trace. 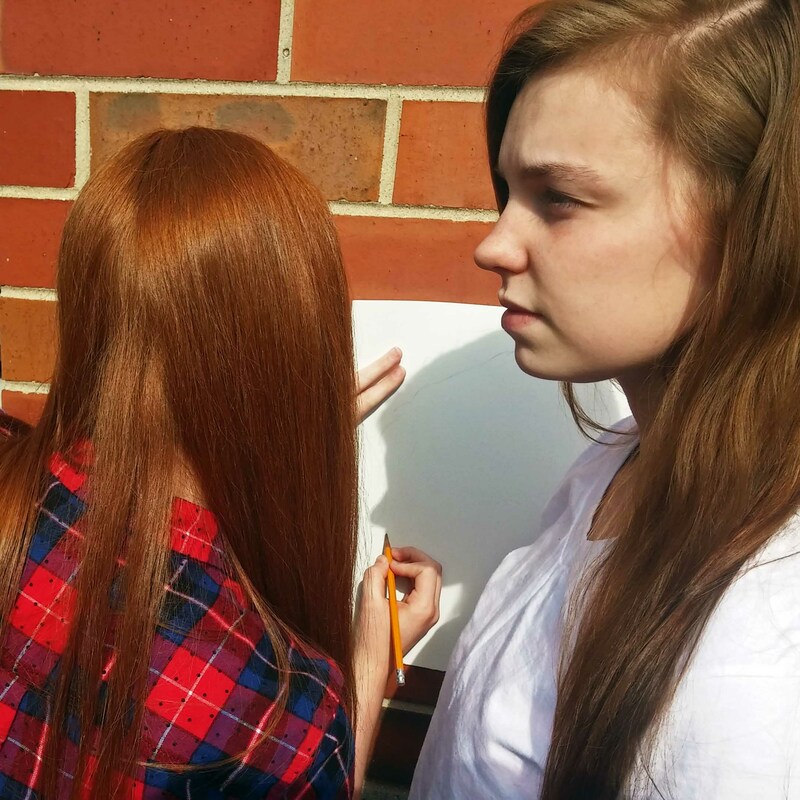 The artist traced the shadow their partner liked or felt symbolized them. They then traced the sitters silhouette. 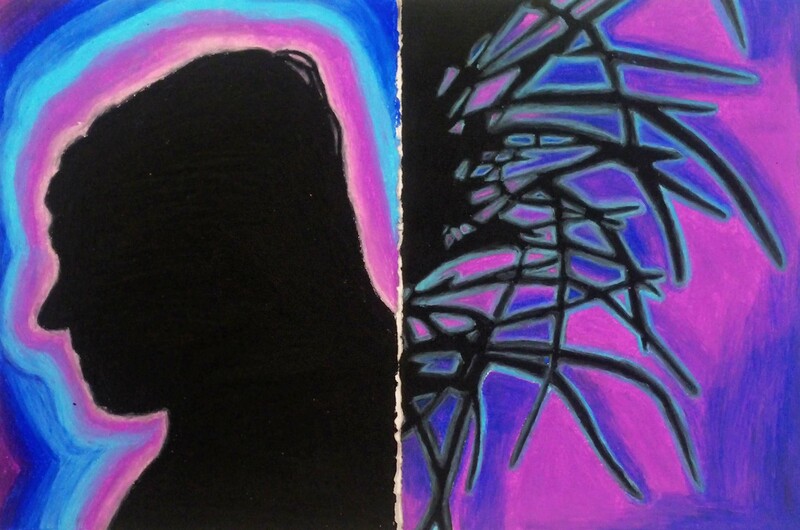 From there we all worked in studio and created these wonderful images through the use of oil pastels. Over these quick 2 weeks or so, a large assortment of strong and conversation starting compositions were created. Works were focused on the positive and negative space the silhouettes created while also being built up upon the idea of color scheme. Working together gave the artwork a collaborative element that previous works did not have. 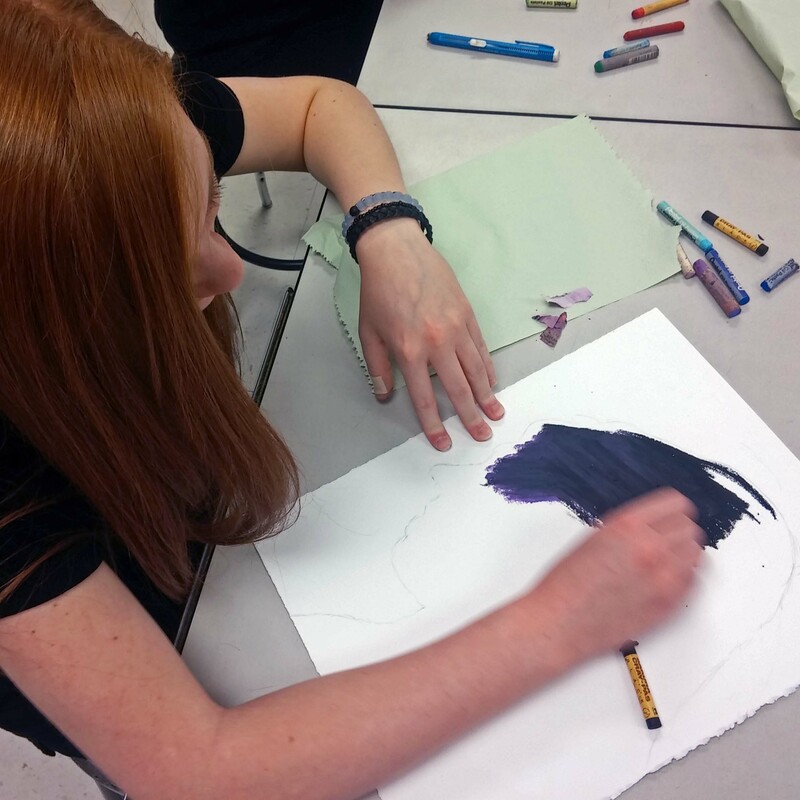 Students were a bit apprehensive about the use of oil pastels, but this was a good choice as time was of a concern. Oils have a quality that really show the mark of the artist and this showed through in many of the works. A few thoughts about the next time that this lesson is taught are to allow more time to work, a mid-critique, as well as a field trip to Todd’s studio in Milwaukee. Each class period began with a virtual trip to Todd’s gallery and discussion about a few works. Personal written reflection happened at the end of each day with students thinking about and responding to the successes and failures that they were experiencing in the work. When we had about a week left, I provided an online written critique (google forms) for them to use as their final exam. All said and done – kids came into the final exam period with their finished artwork, Skype TV turned on, and Todd, my students, and myself I met up online to talk about the ideas and works that were created. Over the course of two days and two separate classes, 20 kids each, a 1 1/2 hour time period we had GREAT critiques, conversation, and reinforcement of many words I spoke of earlier. Todd added a lot of new ideas about intention and symbolism, compositional ideas that were new ideas for the students. The young artists were very interested in Todd’s comments, critique, and support about the work. Discussion of the works was very strong and the students took to the conversation with elements and principles in mind with interpretation becoming even more a highlight. I sincerely hope that the ideas spoken about are carried forward into the individual student work. During the first week of summer vacation, I put out a brief survey to the kids that asked four questions. 1) What are THREE (3) highlights that you found, experienced, or achieved in the working on your shadow / color scheme drawings? 2) What are TWO (2) suggestions you suggest for the next time this artwork / experience gets taught? 3) What is the ONE (1) thing that you feel you will remember / use in the future that you learned from this work of art? 4) Do you have ANYTHING ELSE that you would like to add? Please let me hear more of your thoughts. Survey resultsHERE. While I am not expecting a lot of responses, summer vacation having started, I do hope to get a few comments in about the project. My students works as well as images of the kids in the process of working and critiquing can be seen through this link: https://goo.gl/UgFmbo. TheMidwest Artist Studios™ Project is supported by a grant from the Kohler Foundation, Inc and the Wisconsin Art Education Association.